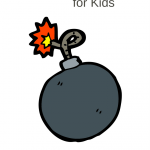 At a glance: A simple parenting tool that teaches conflict resolution for kids. The kids are screaming at each other, she’s fuming… he’s close to tears. I just walked in the room and have no idea what’s happening. The last thing I want to do is take sides. Luckily I don’t have to. I have more than one kid, that means I know conflict is bound to happen. I also know that the way conflict is resolved impacts much more than just this one intense moment. It’s those moments that really teach our kids how to disagree without breaking relationships. Every conflict becomes real life training. And that means… instead of being the referee we get to be the guide. 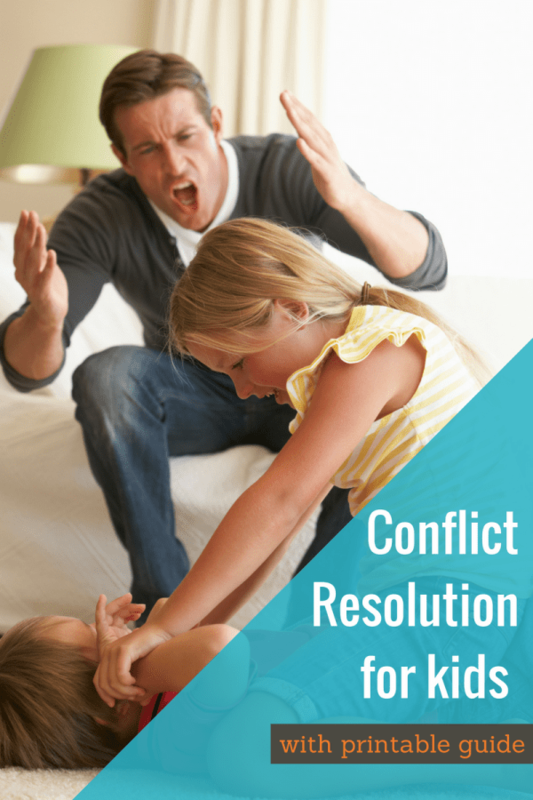 Now that you know why conflict resolution for kids is so important, all you need are the steps to follow when the next conflict arises. I’ve broken it down into 7 very simple steps. Step 1: Remove the item from EVERYBODY involved. (This is a really, really important step in conflict resolution.) Kids tend to feel ownership over anything they are physically touching. And when they feel ownership they will be less likely to work on the problem. If the item is big, like a swing or bike then everyone should be scooted away from it. If the item is small, move it far enough away that no one can reach it. Step 2: Identify the Problem. You’ll want to help the kids break down the problem into simple terms. This is also the point when you take out the emotions and hit the root of the problem. “You want the shovel. I hear that. Does anyone else want this shovel?” The response, a shrug with a timid point toward her bother. Extra tip: Some problems cause such big emotions that it’s important to address the anger before starting in on this step. 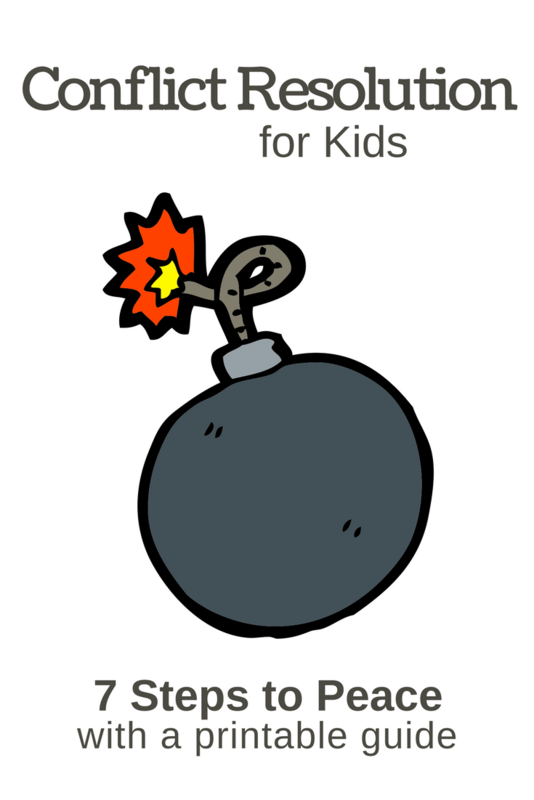 This post has simple ways to work through anger –> Anger Management for Kids. For this parenting trick to work, you are just going to have to bite your tongue. I promise you will be so impressed with the brilliant solutions young kids can come up with. The added bonus is that you don’t have to take sides, a win for everyone! Step 4: Repeat the solution. It doesn’t matter what your kid says, it’s a solution. It might not be a working solution, but it is an idea that should be respected. Step 5: Another solution. Because the two kids are working together to solve a problem they always have the right to refuse a solution. It needs to be done respectfully. Once the other kid agrees all that’s left is the confirmation. The beauty of conflict resolution is that since the kids came up with the solution they are far more likely to stick to it. You should still pay attention and make sure both kids are sticking to the agreement but 9.5 times out of 10 everyone will walk away happy. Now when you walk in and find her fuming… and him close to tears, you just might feel a bit excited to try out being the guide. Enter your info in the box below and I’ll send these 7 steps to conflict resolution for kids right on over to you! Thank you so much for breaking it down step by step. I feel more armed now the next time I have my two nephews with me and they start arguing and fighting. You are very welcome! I would love to hear how it works with your nephews. hmm I have never tried this one with my twins….we have always used take turns for two minutes. I will definitely try this one out soon! Thanks! I hope you find it to be as helpful as I have. Come back and tell me how it went! Awesome! Can I print this and put it on my fridge? Wow. I love this! I was an only child growing up, but I have three children of my own and do not get all the bickering and squabbling at all. This is going to help me. I love the idea of posting it on the fridge. It’s a really empowering tool…I can’t wait to hear how it works at your house. this is brilliant! thank you for sharing and breaking it down into specific step-by-step detail and dialogue. i’m actually “looking forward” to a conflict to see if it works! It is so AWESOME when you feel armed and ready for conflict! I can’t wait to hear how it goes. As an early childhood professional working in the field for over 15 years I am so pleased to see a parent posting such a quality response for other parents. Kudos to you and to those trying to follow this technique. If you are able to follow through consistently, you will be rewarded with children who are adept problem solvers and able to resolve conflicts with both peers and adults. These are social and thought processing skills that will serve your child well into the future! Thank you Jennifer! This comment really makes my day… and I totally agree! I am a child and adolescent mental health counselor and I spend a LOT of my time working with the parents. I love your stuff and have begun to refer parents to your site for those that have access to the internet. (I work with disadvantaged youth and families) Thank you for all your help!!! Thank you so much. I’m touched that you find my information useful and that you are passing along my site. I love this idea for conflict resolution and will print out the idea to have it on hand for our next dispute. I would suggest one more outcome…they forget what they were fighting over and start playing something else. I once watched a Montessori teacher use a similar strategy to yours. I was amazed at how it worked but have forgotten the ‘steps’ with the passage of time. Thanks for writing this out! I love your ideas and the fighting and toy stealing and hitting are happening with my boys. I have a 1 and 3 year old so how can I do the solution. My one year old doesn’t talk yet. I read this yesterday and thought it brilliant. I used it with my 5.5year old and my 17 month old this morning. The little on couldn’t engage, but I went through the steps as best I could with the older one and he came up with a great solution. anyway, getting eventually to the point.. other parents (when I tried to explain what I was doing) all agreed I should not have got involved and that my intervention stopped them sorting it out themselves. . I thought I was helping them learn how to fix things themselves..
Oh Helen I’m so sorry to hear your first attempts in public weren’t as successful as you’d hoped. But I am thrilled to hear it worked so well at home! 17 months is pretty young to get this working, but man you’ll be ready as soon as he (or she) can grasp it. This takes practice for you and your son. Try it a few more times at home until your comfortable and your son feels empowered by it… then take it outside. For me I want to provide the same thing you said “helping them learn how to fix things themselves”. This techniques gives me the words to use and helps them learn the words to use later. Thank you so much for your encouragement 🙂 i think are right, practice more with it at home before trying it out elsewhere. Have you tried it when there is conflict between you and your child? I used this method for twenty years in my classroom… it works every time and soon becomes the norm. You suddenly become the wise council instead of the cop! Thank you for articulating this method so well. I’m currently doing an internship in a daycare center and I encounter those fights about a toy very often . The children are 3 years old. I tried this method, but generally it doesn’t work. On the one hand I have observed that the children a so used to adults resolving their conflicts that they won’t accept a technique asking their participation. (That is one of the reasons I tried to introduce it.) On the other hand I have the impression they are just too emotional in such situations, hitting or throwing themselves to the floor screaming and crying over loosing the desired object. It is just impossible to get them calm down to reason together and find a peaceful solution. Is there anything I can do to introduce this method to children who are obviously not used to it at all? Are they just too young for this method? What a great question! I think I might add it in as an extra step before #1. Helping the kids calm down a bit before starting is very important. Sometimes all it takes to bring calm to these situations is to reinforce that you hear and understand that they are upset. “Wow, you are really upset. You want to play with this truck so much.” Once they know that you see it as a big problem too, they know your are there to help. Remember that this method is not just new to them, it’s also new to you. It might take a while for you to get comfortable with the process and that’s okay. Be patient and see if it becomes a tool that you will work for you. Thank you very much for your answer, Jillian. I won’t give up and keep trying. Thank you for step #0, I think it is very important to get started, especially with children not used to the method. I am now more motivated than ever to keep this going! I can’t wait to hear how it works for you. Jillian, I have two girls, 6.5 and 4, who fight a LOT. But my oldest sabotages my attempts at conflict resolution All. The. Time. She’ll just say “fine she can just have it forever then!” if it’s a fight over an object, and give into the younger one, much to the delight of little sis. I’ve tried telling her that this doesn’t help little sister learn if she just gives into her everytime. I’ve told her it just teaches little that if she puts up enough of a fuss she’ll get her way every time. The longer it takes us to talk out a solution, the greater the chance big one just gives in to little one. I don’t feel this is fair. On the RARE ocassion big one “wins” first, say in your toy shovel example, she would immediately give shovel over to little sis. So ALL THAT WORK FOR NOTHING. ugh. It’s frustrating. Any advice? This is really a great question. I leaned more towards big sis when I was little and my son does the same. It’s true that some people are more willing to walk away then stand up for themselves. This is actually a great way for you to teach your oldest how to stand up for what she wants. To teach her skills in this safe environment to pick the things that are important to her and stand her ground. Here’s what I would try. After a few conflicts sit with her privately. “I noticed that the last few times we worked on a problem between you and sis, you decided to let her have it first. That is very kind of you, but I was wondering something. Is that really what you wanted? You know it’s okay to ask for what you want. You can be kind both to others AND to yourself.” Let her talk and really hear where she is coming from. Remember that some people are just this way and that makes them wonderful givers. Sometimes she would just rather walk away and that is okay. But doing this for a while she should slowly start to learn how to stand her ground in a way that feels comfortable for her. 🙂 I hope that helps. Let me know if you want to talk about it. I foresee a major problem. What if he wants to finish digging his hole in two or three days? Then she says he is taking too long. Then you have to take the shovel away and tell them “they’ve had enough time to play with the shovel.” Then she gets it but he says you all agreed he would have it until he was done. Then you create a conflict stemming from the original conflict. You failed to mention the boundaries or limitations. How long can he have it for? Doesn’t matter if he completes his hole or not. He has to finish the hole in that timeframe or he doesn’t finish digging it. This is an amazing technique. I had just finished reading it and there was a situation with my two (5yo and 8yo) over sharing. I tried this and it worked amazingly. Tried it agin later te same day and they already knew where I was going with it and quickly worked out a solution. Same here…No luck getting the printable. I’m eager to have the reminder on my ‘frig as well. This is brilliant! Sending you the print out now! When I enter my email for the printable, the symbol just keeps spinning but never completes the task. I’ve tried it for 3 days now. Can I attach my email here and have you send it to me? This will work wonders with my twin 5 year olds!